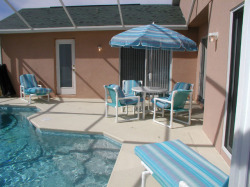 Imagine your family after a day of Florida fun coming home to a spacious relaxing 4 bedroom villa in a tranquil setting overlooking a small lake. While your kids start playing in the private pool, you can relax in a comfortable air-conditioned living room or outside on the bug-screened sundeck. The villa has 2 master bedrooms with en suite bathrooms(each with cable TV), 2 more bedrooms with 2 twin beds in each, a third bathroom. 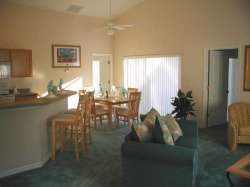 A fully equipped kitchen with dishwasher, microwave, large refrigerator/freezer. 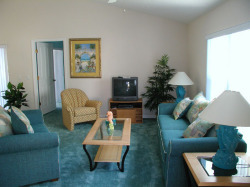 Living room with cable TV,VCR,DVD Hifi and a selection of games, books, and videos and DVDs. A games room with darts, a pool table, table tennis and ice hockey games, along with a game cube and PS2 video game systems. 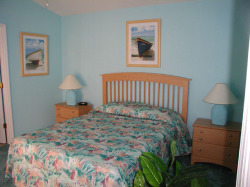 Free high speed wireless internet, and telephone calls to USA and Cananda. Also included is a washer/drier linens, pool towels, hairdryers. We do accept Visa and Mastercard payment.